So off to university I skipped, with paternal instructions to “blossom”. I did BSc Chemical Physics at Bristol University. This is a fine course for the indecisive, such as myself who couldn’t decide whether they were chemists or physicists. There were only 16 students in my year, we could all fit in one lift in the physics building. The chemical physics degree involves most of the first year chemistry and physics courses, but in later years you drop organic chemistry, particle physics and astrophysics to make space to do courses in the rest of chemistry and physics. This training means I’m less bemused by molecules than the majority of physicists. 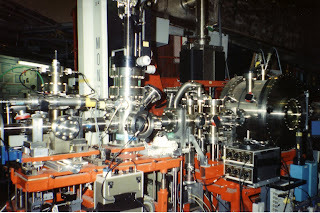 It was at Bristol that I was introduced to big, shiny machines for doing science: for my final year project I worked on Extended X-ray Absorption Fine Structure (EXAFS) at the Daresbury Synchrotron Radiation Source (SRS). I was using EXAFS to discover something about the structure of molecules in solution, and the arrangement of a glass around metal ions. This is typical of the sorts of study done at synchrotron sources: finding exactly where the atoms in a particular material. Where the atoms are helps you understand the properties of the material: what reactions does it catalyse, how well does it conduct, how strong is it, and so on. The synchrotron radiation source is a device for producing huge quantities of light all the way across the spectrum from x-rays to ultra-violet light, passing through the visible spectrum on the way. To do this you make electrons go round and round in circles really fast inside an evacuated tube, as they go around they emit electromagnetic radiation: here’s a practical application of relativity – the electrons are traveling at a substantial fraction of the speed of light, so to calculate (and control) their behaviour you need to include relativistic effects. X-rays are actually emitted when the electrons pass through the intriguingly labelled wigglers and undulators – sets of cunningly arranged magnets around the evacuated tube. The SRS was a pretty big machine – 30 metres in diameter, it closed at the end of 2008 to be replaced by Diamond which is substantially larger. You can see SRS, along with Diamond (near Harwell) and the ESRF in Grenoble, which is even bigger still, on this Google Map. The ring shape of SRS is just about apparent, Diamond and ESRF are very obviously rings. I’ve worked in several big science facilities (all of them either neutron or synchrotron sources), they have some common features. 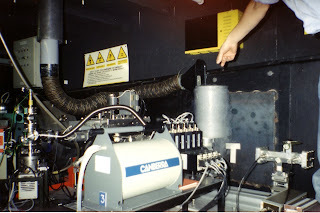 Separate instruments cluster around either a ring shaped source or a central point – a beam line (usually an evacuated metal tube) runs from the source to your experiment. The instruments have been built for different consortia by a small team and then used by scientists from around the world. The instruments are scattered around warehouse-sized sheds, filled with a wide range of machinery (which generally contribute to rather high background noise). The control stations for each instrument may be in portacabins, or small corrals. For neutron and x-ray facilities there are a lot of really big concrete blocks around to block harmful radiation. The deal with working on these instruments is that they run 24 hours a day, and you apply for time on them. If your application is successful then you get to use the apparatus for a block of time, typically a couple of days or so. Some users are lucky: their experiments take days or hours to run, so they can pop off to the pub between runs. I’ve always been stuck doing experiments which last 20-30 minutes per shot. Normally you try to get a team of three or four people to work in shifts, through the night you survive on machine coffee, cantankerous vending machines and possibly loud music. You try to do data analysis as you go, to make sure nothing is going wrong and to help pick which samples to run next. These are one-off research machines, so the data analysis process may be a bit convoluted, and not very user-friendly. 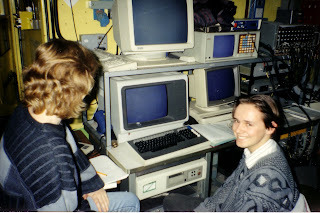 This is me looking really very boyish at the control station for the EXAFS machine, that’s the back of Sue’s head. Sue was a PhD student working in the same lab as me. I’m pretty sure this is the EXAFS station I worked on, John is pointing at a polysytrene vessel containing liquid nitrogen (not quite sure why). John was another member of the research group. This isn’t the equipment I was using but see how shiny it is, how many bolts hold it together and how many unexplained protruberances it has. Who can but fall in love with such things? All in all it was a rather exciting introduction to the world of research science. My rather small contribution to the measurement of cobalt ions in glasses (which were subtle shades of blue and pink) led to my first paper in the scientific literature! 1. Harrison, C.C., X.C. Li, I. Hopkinson, S.E. Stratford, and A.G. Orpen, Ultraviolet-Visible-Near-Infrared and EXAFS Study of Co-Ii Coordination Chemistry in Post-Doped Silica Sol-Gel Glasses. Journal of the Chemical Society-Faraday Transactions, 1993. 89(22): p. 4115-4122. I've spent the better part of my career to date floating around the edges of a large structural biology group (that of the Director of Diamond no less), supplying copious quantities of protein and dispensing liberal amounts of assistance in molecular biology to the 'crystal slaves' (though I've done more than my share of setting up trays!). 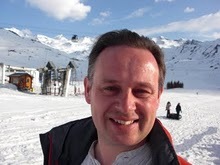 Of the three sites, Grenoble is the most pleasant. The canteen serves wine at lunchtime (or at least it did 10 years ago).